Photos of the poster circulated social media. Seven white nationalist propaganda posters were found on campus Monday, according to an email to the Emerson community sent by President M. Lee Pelton the next day. 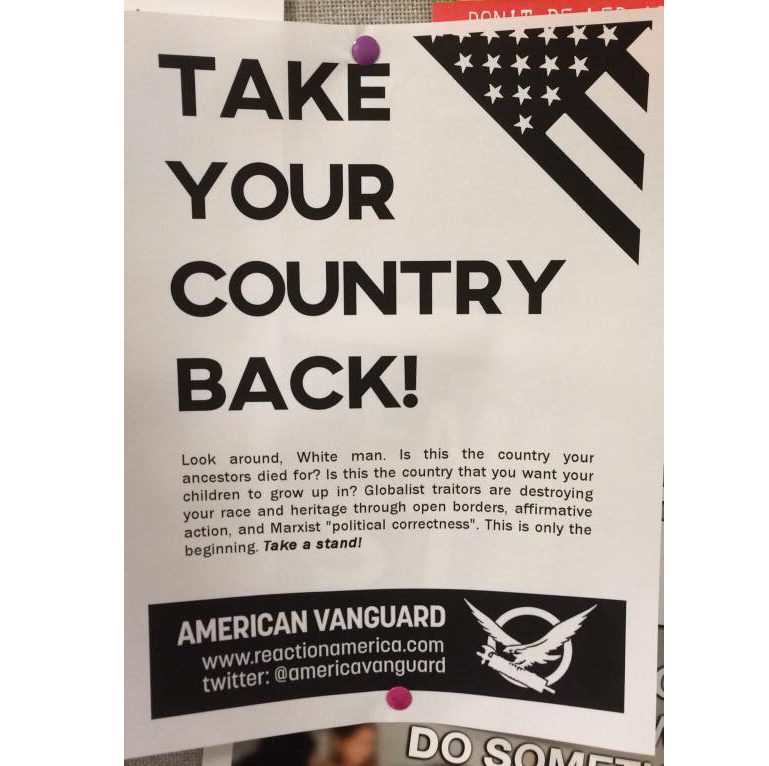 The posters advertised the so-called far-right group American Vanguard, which explicitly calls for the reclamation of a white America on their website. Its logo, pictured on the posters, depicts a bird carrying a fasces, or a bundle of rods tied around an axe, from which the term “fascist” is derived. In an interview, Pelton said he didn’t know if the posters were put up by a member of the Emerson community. Pelton said the Emerson College Police Department is investigating the incident. Six of the posters were found in the Walker Building and at least one was in a residence hall, Pelton added. James Hoppe, vice president and dean for campus life, wrote in an email to the Beacon that the bias report filed about a poster in a residence hall did not specify which residence hall. Scarlett Shiloh, a sophomore visual and media arts student, said they found two of the posters in the Walker Building on Monday and immediately reported them to ECPD. Robert Amelio, director of diversity and inclusive excellence, said there had been racist graffiti on campus before, but nothing from American Vanguard, to his knowledge. Amelio said it is important for white community members to condemn racism more vocally. Pelton said the posters angered him because he saw them less as propaganda and more as an attempt to scare the community.